Renato Russo was the poet of the nineties for Brazil's youth, just like Cazuza (lost to AIDS in 1990 at 34) had been to the eighties and Raul Seixas had been in the seventies (Seixas,an alcoholic, died in 1989 at 47). Sadly, like his predecessors, Renato Russo did not live long. The public lost his talent to AIDS in October 1996, not long after his last album with his band, Legião Urbana, had been released. Today, almost three years after his passing, the cult built around his music continues to grow. I recently conducted a poll among some of my English students, and Legião Urbana is among the favorite bands of present-day teenagers who weren't even aware of their existence in their recent childhoods. Just as I had reacted, I suppose, to the Beatles. I recall 1987 when Legião Urbana's first single came out. It was a simple song, called "Eduardo e Monica", a humorous ditty about an unlikely couple formed by a young teen, Eduardo,"who liked soap operas and enjoyed playing button soccer with his grandpa", while Monica was fond of Rimbaud. 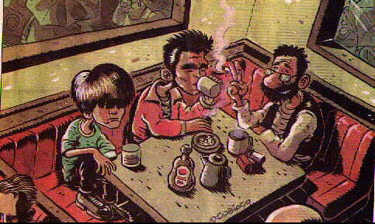 When Russo, the group's lyricist and vocalist, belted out, in a punk-inspired song that his era was of "the sons of the revolution, the Coca-Cola generation", this was a clear metaphor that encompassed not only American imperialism but the 1964 military coup that had dictated to Brazil for over 20 years. In the short time he had, he had said much. Renato Russo was born in Rio de Janeiro in March 1960. His father was an employee of Banco do Brasil , and his mother, a teacher of English as a foreign language. His real name was Renato Manfredini Jr. His stage name was a triple tribute to Jean-Jaques Russeau, Bertrand Russell and Henri Russeau. He lived during a part of his childhood in the U.S. and then, at 15, he moved to the country's capital, Brasilia, where he experienced stirrings of an interest in music. At the time, the punk scene kicked in, and he jumped the bandwagon, forming his first band, Aborto Elétrico(Electric Abortion), which later became Legião Urbana. In the meantime, he made his living as an English teacher and also held other jobs. In 1985 he and his band were signed into EMI records and soon became the nation's number one band, despite the fact that its other three members, Dado Villa-Lobos(guitar), Marcelo Bonfá (drums) and Renato Rocha (bass) couldn't play very well. In fact, that didn't matter much, since their public was not interested in musical virtuosity, but in Russo's poetry and his fine baritone voice. Their subsequent albums were huge successes, and the songs were instant classics. Many famed Brazilian musicians re-recorded their songs, and soon the music of Legião Urbana was being noticed by consumers of other styles. Renato did not enjoy live appearances, mainly because Legião Urbana seemed to attract rioters wherever the group played. In 1986, a show in Brasilia ended with the death of a fan. Two years later, another gig in the same town ended with 60 injured. The tours did not do well, Renato was, at the time, regular user of heavy drugs, disabling his own ability to perform. Renato was a man in constant conflict, and drugs were his comfort. In 1989, the group (minus Renato Rocha, who left the band soon after the chaotic 1988 tour) released Quatro Estações (Four Stations), which was, critics and fans agree, their magnum opus. 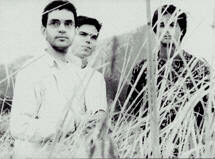 "I think I like São Paulo, I like St. John (a traditional local festivity) I like San Francisco and St. Sebastian (Rio de Janeiro's original name) and I like girls and boys too.."
Renato Russo (left) with the other members of Legião Urbana In a 1990 interview to Showbizz (then Bizz), Brazil's version of Rolling Stone magazine, Renato finally admitted he was gay. At the time, his attitude was considered controversial, since his public was made of homophobic youngsters, and it did cost the group some mileage with its fans--but for a short time only. The public, in general, witnessed see that Renato seemed a much happier person, free from the sexual conflicts that had for so long done damage him. However, he did not become an advocate of gay rights. He just came out and went on with his life and his music. In the next two years, two more albums came, and Renato slowly seemed to clean up from his drug habit. Finally, in 1993, the band released O Descobrimento do Brasil (Brazil's Discovery) which had many songs that spoke of farewells. The band, however, seemed as tight as ever, but they declined from touring to promote the album. In the next few years the band remained silent. Russo, however, didn't. He released his first solo album in 1994, titled The Stonewall Celebration Concert. It contained several English-language songs, all of them covers of his favorite songs. The repertoire was very eclectic, ranging from Irving Berlin's ("Say It Isn't So") to Bob Dylan's ("If You See Him, Tell Him I Love Him", a clear message to his male lover). This writer's personal favorite is Madonna's "Cherish", which received a very acoustic treatment. A good part of the net profits of the album were (and are still) donated to charity. His next solo effort was an Italian language album, Equilibrio Distante (Distant Balance), in which he wanted to escape from his intellectual image and sound, he stated, "corny". The album became a huge commercial success which not only attracted his fans but also people who would never, under other circumstances, have bought one of his albums. He'd also started a local fad on behalf of Italian music, and many other local performers mimicked his style. More recently, Italian-Brazilian former sixties rocker Jerry Adriani (who, many people say, sounds just like Russo) released an album with Italian-language versions introducing the songs of Legião Urbana. There was a lot of excitement over a new Legião Urbana album in 1996. The album , A Tempestade (The Storm), was finally released in October, and there was a lot of talk of a tour. Sadly, that did not come true, for Renato Manfredini Jr. passed away a mere three weeks after the the album's release. Many of the tracks, his band mates later admitted, were recorded "in a lot of pain over Renato's condition". have been, so far, three posthumous releases of both solo work and of his band. 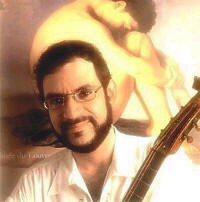 The first, O Último Solo (The Last Solo), released in 1997, has tracks which were left out of Russo's two solo albums. It only has eight tracks, among them Gershwin's "I Loves You Porgy", from the classic musical Porgy and Bess.The year also saw the release of Uma Outra Estação, which included songs that had originally been recorded for the 1996 album, and had Renato Rocha back on bass guitar (in the other albums, Russo and Villa-Lobos shared that instrument, which was played by a hired musician on stage) The most recent one , released last year, is the band's 1992 MTV Unplugged concert, which quickly reached first place in sales. What is Legião Urbana's legacy? I guess its too early to say. The band has proved its longevity, and its popularity. Three years after Russo's death, it remains a constant presence on the radio. Recently another band from Brasilia, "Os Paralamas do Sucesso", re-made a live version of one of Legião Urbana's earliest hits, "Que País É Esse (What Country Is This)", a slap in the face of the country's governmental system. Dado Villa-Lobos guested on the track and is currently touring with them. Everywhere youngsters pick up guitars and sing Russo's songs, keeping the flame alive. This writer was not a fan, having liked only a handful of the band's songs. But I cannot deny the power of Renato Russo's creative consciousness. He wove lyrics with immense poetical value, and even when the verses were not his, he gave a personal feeling to them. Russo, though dead, lives in his verse, and will not easily be forgotten.